So, again, I must repeat that the city is full of markets, fleas, and festivals. 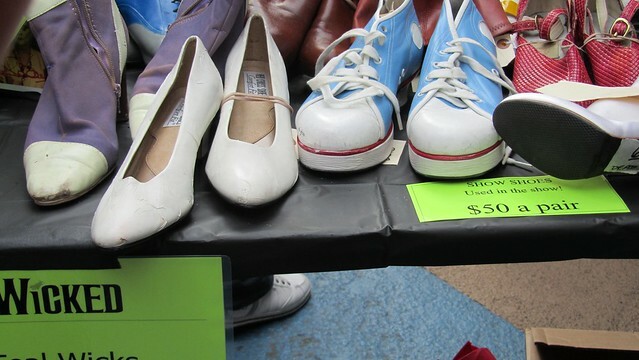 Some better than others and the Broadway Flea did not disappoint. Imagine, if you will, a charity flea where each booth is raising money for their charity and vying for a year’s worth of bragging rights, and then imagine that each booth is manned by actual on and off Broadway stars and crew-members. It was brilliant. Most offered really unique gifts like performance worn wardrobe, autographed playbills, their team bowling trophy, and home baked goods! The cast of Wicked immediately sold me on a banana walnut loaf that I saved for later (I never got to eat it – more on that later). broadway flea 2011. mary poppins cast. broadway flea. debra monk. she was super nice and I backed away from her out of sheer intimidation. I recognized the children from the cast of Mary Poppins and as I was perusing autographed scripts at a booth suddenly Debra Monk just popped in and I realized everything there was hers. Each script showed signs of wear and tear and had her name on it, each trinket came from a set or a stage that she participated in. It was really a great day. We saw piles of memorabilia just strewn about tables, there were autographed this and that and show-worn whatsits galore. It was hard to know where to start. Moreover, if you saw a show and didn’t buy their keychain or t-shirt, someone was likely selling it. We even did this giveaway where you paid for raffle tickets that were stapled together. if it said winner inside they you got tickets to an unknown show. I didn’t win but they did get my $10 and it was exciting to rip them open. I did hear “I won” and “I can’t believe it” called out from a few folks in my vicinity though. The Rock of Ages table was where I really fell over myself. Have I mentioned that ROA was my very first Broadway show? We saw it in 2009 on our 1st visit to the city. We didn’t want to wait in the TKTS line which appeared to be 10 hours long and a guy handed us the ROA flyer and said the show was great and the prices were right so we decided to pay full price at the window for that. It turned out the prices were indeed good and the show was amazing (save for the very uninterested texter who sat beside me during the show). How better to fall in love with a medium than with 80s rock anthems and a love story or two? broadway flea. rock of ages. broadway flea. playbills. 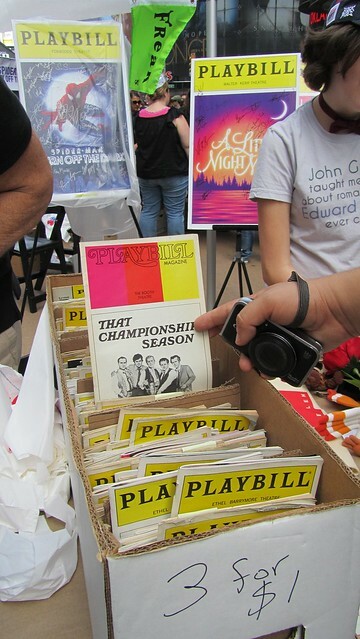 these are just a few playbills from just one vendor. there were a ton of them all over. Anyway, I spied Justice and immediately gushed over her. It was embarrassing but what can I say I love her and the show. She was great about it. I don’t have a lot of experience bumping into celebrities or should I call her a Broadway star? Either way, I figured it was ok to talk to her since her presence at the booth was simply to raise money from adoring fans(?). I tried not to ramble too much but I did tell her that I loved her and the show and that I’d see it in April 2009 at Brooks Atkinson Theater and I thought the new cast was amazing and the new theater also wonderful. (they downsized theaters and many on the original cast are now on the national tour.) As I tried to peel myself away from her I realized my husband had engaged in conversation with a man I didn’t recognize at the ROA booth as well. They were talking about how awesome Austin is of all things. And right beside the man who must have been a backstage person was Sherrie! She was so normal and human and friendly and anyway, after we bought an autographed playbill and wandered away I realized I didn’t get a single snap of the booth or them or ask for a photo with them or anything. I am clearly a rookie at this. I wanted to go back and ask but then I thought I would look silly doing that. So I just glanced back at the booth longingly a few times as we made our way through the street. One vendor offered playbills from shows older than me, older than… they were from the 1940s! I thought surely there was something I should buy but then I realized I don’t know what was amazing back then, I don’t have any point of reference, and also what would I do with this old playbill? Frame it in some place of honor in my home? To what end? So I perused a little and moved on politely. broadway flea. wicked shoes. awesome. The day of wandering and oogling Broadway memorabilia and its stars just made me want to see more shows. There are so many I haven’t seen and so many that have closed without me ever making it in the doors. At brunch my high continued with a super indulgent chicken and waffles from Southern Hospitality in Hell’s Kitchen and nothing could top the soulful sounds of the singer/guitarist who serenaded the dining room. The day of the Broadway Flea was one of the best days full of adventure and happy thoughts. It wasn’t until we were getting the bill that my phone rang. “Mom” it said, I had to run out of the restaurant to answer the call. “We are on the way to the hospital” I couldn’t breathe until she said “they called us, they said to come now, we are on our way,” I knew what she was saying and yet I had to hear her say it. I made her clarify that this was for my dad’s lung transplant. The day of the Broadway Flea 2011 is the day before my dad got his new lung. broadway flea. southern hospitality. my meal before getting the call that my dad was on his way to the hospital. 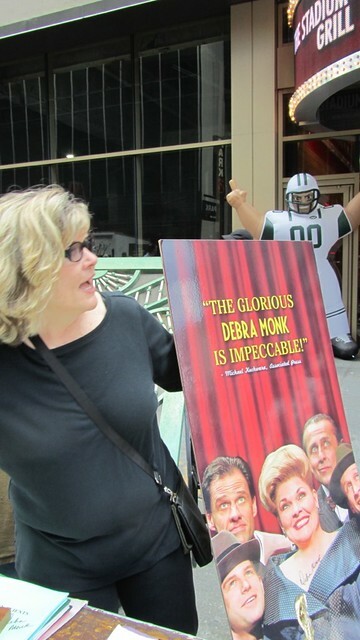 This entry was posted in events, everything i've blogged, food, locations and tagged broadway, dad, dining out, Firsts, manhattan, Pulmonary Fibrosis, Texas, theater, Times Square, walking, weekend adventure. Bookmark the permalink. 2 Responses to broadway flea.